Download "MAXIMA HUNTER HERITAGE HUNTING ARROW. shafts carbonexpressarrows.com"
2 arrow assembly INSTALLING PRESS FIT NOCKS Firmly press the press fit nock into the shaft by applying pressure to the nock valley base only. Do not put direct pressure on the nock tabs - direct pressure on the nock tabs may cause the nock to deform, crack or break. Once seated flush against the shaft, the nock can be turned for precise tuning. Press fit nocks do not have to be glued to the shaft. INSTALLING CARBON EXPRESS GLUE-IN TARGET POIN Using a swab and denatured alcohol (available at most hardware stores), clean the inside of the shaft and the outside of the shank portion of the component. Apply a generous amount of glue* to the shank of the component. Push the component into the shaft while simultaneously turning in order to evenly spread the adhesive until firmly seated. *Note: Use only an adhesive made for attaching components to carbon shafts. We recommend CX Express Bond or a slow setting epoxy for the best long term results. *CX Express Bond (Model M1037) with maximum adhesive strength should be used when installing carbon arrow components like points for the best long term results. DO NOT USE A QUICK SETTING EPOXY. Quick setting epoxy can become brittle during the hardening process and may not create a sufficient bond between the arrow shaft and component. DETERMINING YOUR CORRECT ARROW LENGTH Using the bow and release system that you normally use (mechanical or fingers), draw the bow back to your anchor point. Have someone mark the shaft where it comes into contact with the front of the riser. Measure the length of the shaft from where the nock contacts the string (nock valley) to the spot marked. This distance is your standard arrow length. We recommend you cut one shaft and install the front end hardware of your choice to make sure the shaft is the correct length before cutting the other shafts. Procedures for Cutting Carbon Arrows 1) Always use a high-speed cut-off tool (above 5,000 rpm) with an abrasive wheel when cutting carbon shafts. Using tube cutters or hand saws will damage the carbon fibers. 2) Always cut carbon shafts with nocks in place. WARNING: Always use the appropriate respiratory protection (NIOSH Approved Dusk mask), and eye protection (safety glasses) when cutting arrow shafts. Preparing Carbon Shafts for Fletching 1) Using a clean white paper towel, wipe the shaft where the fletching will be applied with denatured alcohol. Continue to lightly wipe the shaft with alcohol until all carbon dust and residue is removed. 2) Wipe the base of the vanes with denatured alcohol also. Some vane producers use a mold-release agent in the manufacturing process that must be removed for solid adhesion between the shaft and vane. 3) Do not touch the portion of the shaft to be fletched, or the base of the vane, or allow them to come into contact with any surface once they have been cleaned. Fletching Carbon Shafts 1) We recommend carbon shafts be fletched with CX Express Bond or super glue gel designed for carbon arrows. 2) Carbon shafts can be fletched with standard fletching jigs and clamps. For optimum performance and flight stability, we recommend bowhunters fletch their shafts using a helical clamp or a straight clamp with the jig offset at least 2 degrees. Re-Fletching Carbon Shafts (WARNING: Never soak carbon shafts in any harsh chemical, including acetone.) MEK can be used on carbon shafts without damage to the finish if it is rubbed on the shaft with a clean rag. 1) Use a dull knife to remove old fletching and glue. Be very careful to only remove fletching and glue - do not remove any carbon fibers. 2) Repeat steps 1-3 detailed under Preparing Carbon Shafts for Fletching. 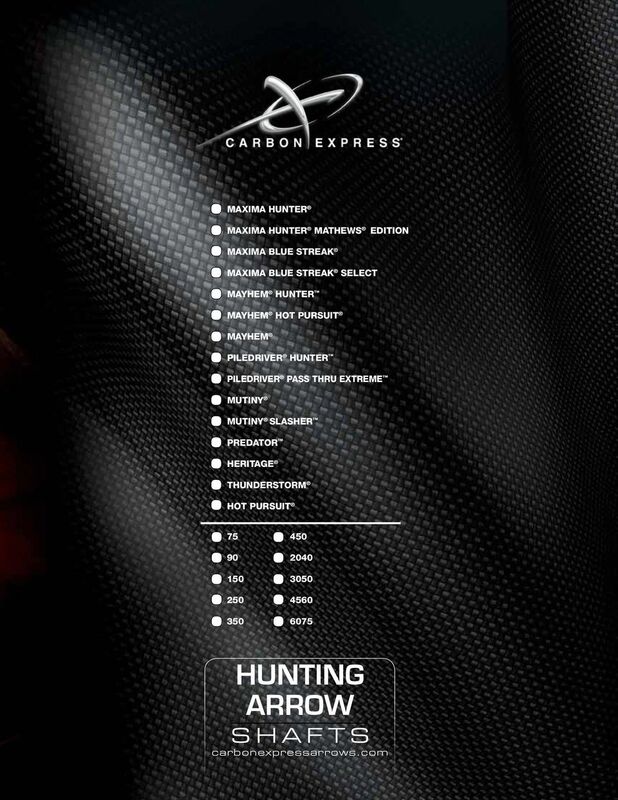 DISCLAIMER While Carbon Express is committed to bringing its customers the best arrows, the arrows are not designed to impact a metal, plastic, concrete or other hard surface. 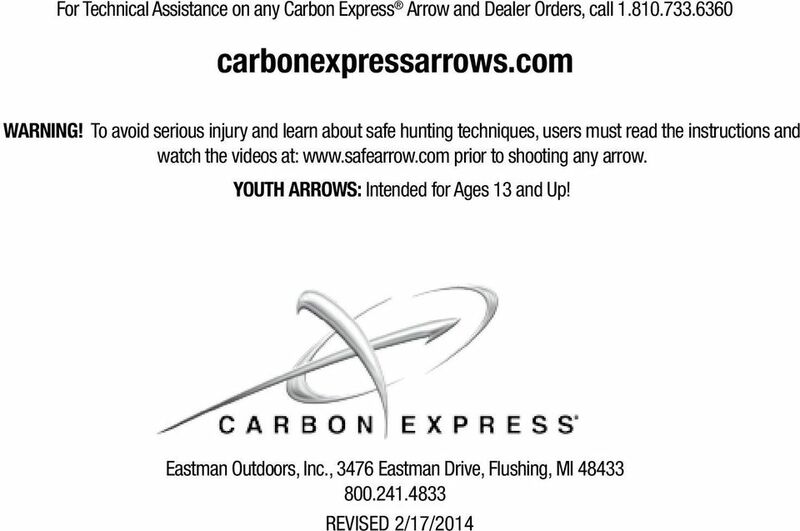 Firing any Carbon Express arrow into such a hard surface will not only damage the arrow, prohibiting any other use, but may also cause serious injury or death. Shooting an arrow into a target encased in plastic or other hard surface, such as a decoy designed with such attributes, exposes the arrrow to such conditions, may damage the arrow and/or cause serious injury or death. Such a target should not be used with any Carbon Express arrow. Use of such arrows with a hard surface impact voids any warranty, express or implied. Safety Warnings for Archers The use of a bow and arrow requires considerable skill and should be treated with caution to avoid injury to persons and/or property. Bows and arrows should only be used by those who are properly trained in safety or under the supervision of a qualified instructor. Safety glasses should be worn while working with archery equipment. 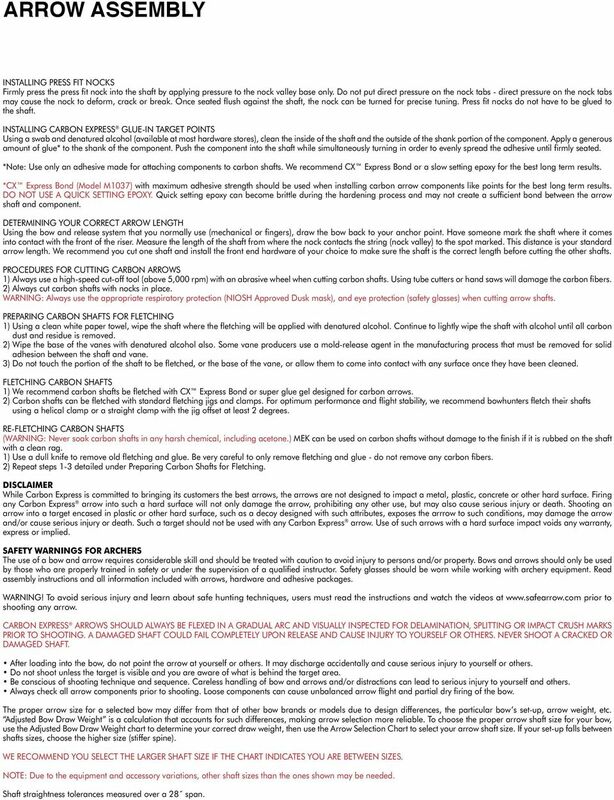 Read assembly instructions and all information included with arrows, hardware and adhesive packages. Warning! To avoid serious injury and learn about safe hunting techniques, users must read the instructions and watch the videos at prior to shooting any arrow. carbon express arrows should always be flexed in a gradual arc and visually inspected for delamination, splitting or impact crush marks prior to shooting. A damaged shaft could fail completely upon release and cause injury to yourself or others. Never shoot a cracked or damaged shaft. After loading into the bow, do not point the arrow at yourself or others. It may discharge accidentally and cause serious injury to yourself or others. Do not shoot unless the target is visible and you are aware of what is behind the target area. Be conscious of shooting technique and sequence. Careless handling of bow and arrows and/or distractions can lead to serious injury to yourself and others. Always check all arrow components prior to shooting. Loose components can cause unbalanced arrow flight and partial dry firing of the bow. The proper arrow size for a selected bow may differ from that of other bow brands or models due to design differences, the particular bow s set-up, arrow weight, etc. Adjusted Bow Draw Weight is a calculation that accounts for such differences, making arrow selection more reliable. 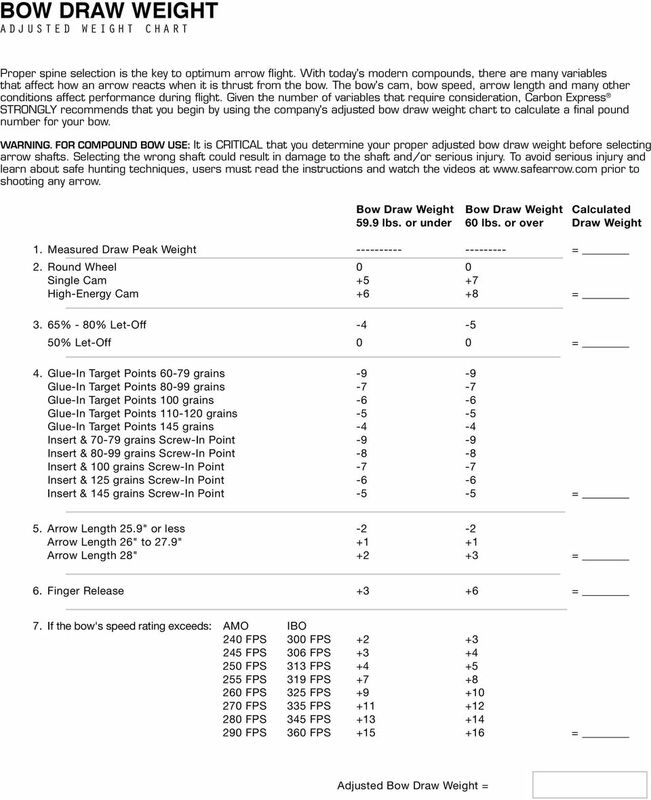 To choose the proper arrow shaft size for your bow, use the Adjusted Bow Draw Weight chart to determine your correct draw weight, then use the Arrow Selection Chart to select your arrow shaft size. If your set-up falls between shafts sizes, choose the higher size (stiffer spine). 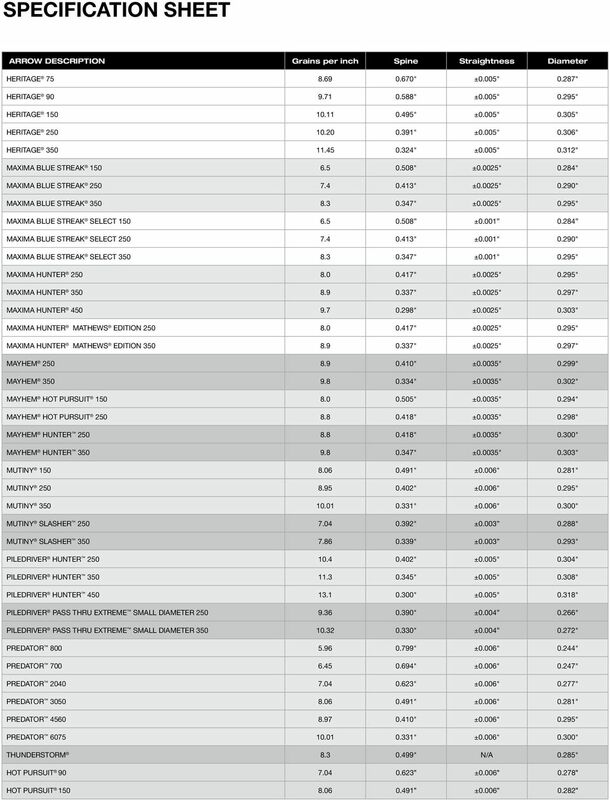 WE RECOMMEND YOU SELECT THE LARGER SHAFT SIZE IF THE CHART INDICATES YOU ARE BETWEEN SIZES. 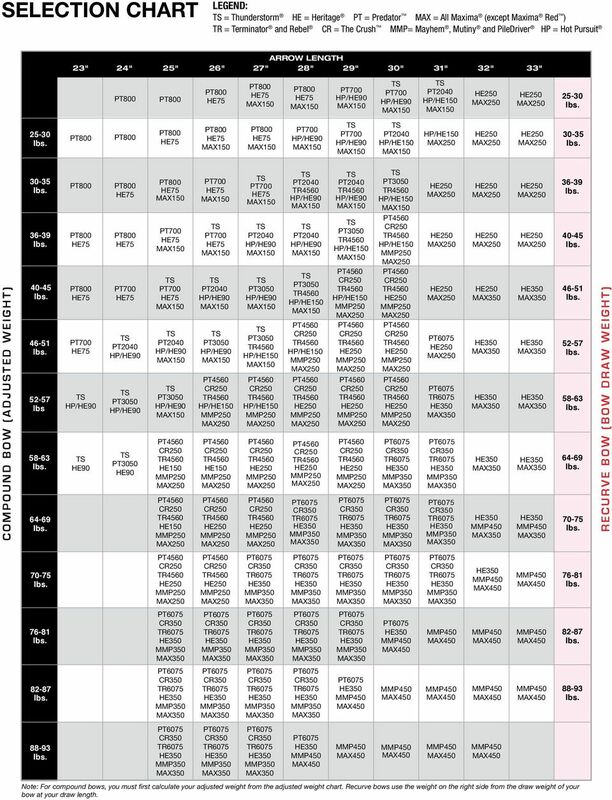 NOTE: Due to the equipment and accessory variations, other shaft sizes than the ones shown may be needed. Shaft straightness tolerances measured over a 28 span. 5 SPECIFICATION SHEET ARROW DESCRIPTION Grains per inch Spine Straightness Diameter HERITAGE " ±0.005" 0.287" HERITAGE " ±0.005" 0.295" HERITAGE " ±0.005" 0.305" HERITAGE " ±0.005" 0.306" HERITAGE " ±0.005" 0.312" MAXIMA BLUE STREAK " ±0.0025" 0.284" MAXIMA BLUE STREAK " ±0.0025" 0.290" MAXIMA BLUE STREAK " ±0.0025" 0.295" MAXIMA BLUE STREAK SELECT ± MAXIMA BLUE STREAK SELECT " ±0.001" 0.290" MAXIMA BLUE STREAK SELECT " ±0.001" 0.295" MAXIMA HUNTER " ±0.0025" 0.295" MAXIMA HUNTER " ±0.0025" 0.297" MAXIMA HUNTER " ±0.0025" 0.303" MAXIMA HUNTER MATHEWS EDITION " ±0.0025" 0.295" MAXIMA HUNTER MATHEWS EDITION " ±0.0025" 0.297" MAYHEM " ±0.0035" 0.299" MAYHEM " ±0.0035" 0.302" MAYHEM HOT PURSUIT " ±0.0035" 0.294" MAYHEM HOT PURSUIT " ±0.0035" 0.298" MAYHEM HUNTER " ±0.0035" 0.300" MAYHEM HUNTER " ±0.0035" 0.303" MUTINY " ±0.006" 0.281" MUTINY " ±0.006" 0.295" MUTINY " ±0.006" 0.300" MUTINY SLASHER " ± " MUTINY SLASHER " ± " PILEDRIVER HUNTER " ±0.005" 0.304" PILEDRIVER HUNTER " ±0.005" 0.308" PILEDRIVER HUNTER " ±0.005" 0.318" PILEDRIVER PASS THRU EXTREME SMALL DIAMETER " ± " PILEDRIVER PASS THRU EXTREME SMALL DIAMETER " ± " PREDATOR " ±0.006" 0.244" PREDATOR " ±0.006" 0.247" PREDATOR " ±0.006" 0.277" PREDATOR " ±0.006" 0.281" PREDATOR " ±0.006" 0.295" PREDATOR " ±0.006" 0.300" THUNDERSTORM " N/A 0.285" Hot Pursuit " ±0.006" 0.278" Hot Pursuit " ±0.006" 0.282"
Portable Grinder I. Competencies Given a properly adjusted portable grinder, instruction and demonstration of use, each student will be able to: A. Identify the major parts of the portable grinder. B. 2011 a r c h e r y carbonexpressarrows.com Shoot Better with Carbon Express To gain the advantage in the field, you need the best equipment, which is why so many hunters insist on the Carbon Express brand. Grinder. B. Pass a written test on safety and operating procedures of the grinder with a minimum of 100 percent accuracy. PRT TRANSITION BOOT INSTALLATION (ZT05-98-001) CAUTION: Prior to beginning any work on production assemblies it is suggested that installers practice using this material and instructions on mockup assemblies.